Utah State Paleontologist James Kirkland stands near a full-size cast of the newly discovered dinosaur Falcarius utahensis. Credit: Gaston Design, Inc.
Scientists have discovered a mass graveyard of bird-like feathered dinosaurs in Utah. The previously unknown species provides clues about how vicious meat-eaters related to Velociraptor ultimately evolved into plant-munching vegetarians. Discovery of the bizarre new species, Falcarius utahensis, is reported in the Thursday May 5 issue of the journal Nature by paleontologists from the Utah Geological Survey and the Utah Museum of Natural History at the University of Utah. The adult dinosaur walked on two legs and was about 13 feet long (4 meters) and stood 4.5 feet tall (1.4 meters). It had sharp, curved, 4-inch-long (10 centimeter) claws. Falcarius, which dates to the Early Cretaceous Period about 125 million years ago, belongs to a group of dinosaurs known as therizinosaurs. 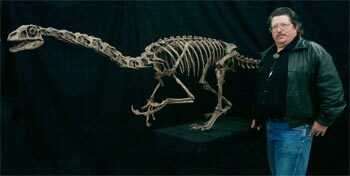 The group includes feathered dinosaurs such asBeipiaosaurus that were found in southeast China in recent years. Falcariusand Beipiaosaurus are about the same age and appear to represent an intermediate stage between deadly carnivores and later, plant-eating therizinosaurs. Falcarius is anatomically more primitive than the Chinese therizinosaurs. Falcarius “is the most primitive known therizinosaur, demonstrating unequivocally that this large-bodied group of bizarre herbivorous group of dinosaurs came fromVelociraptor-like ancestors,” says study co-author Lindsay Zanno, a graduate student in geology and geophysics at the University of Utah and the Utah Museum of Natural History. Falcarius did not descend directly from Velociraptor, but both had a common, yet-undiscovered ancestor, says study co-author and paleontologist Scott Sampson, chief curator at the Utah Museum of Natural History and an associate professor of geology and geophysics at the University of Utah. With almost 1,700 bones excavated during the past three years, scientists have about 90 percent of Falcarius’ bones and believe the skeletal remains show several signs of this major evolutionary transition. It had leaf-shaped teeth designed for shredding plants rather than the triangular, blade-like serrated teeth of its meat-eating relatives. Its pelvis was broader, indicating a larger gut to digest plant material, which is more difficult to process than meat. Its lower legs were stubby, presumably because it no longer needed to run after prey. Compared with carnivorous relatives, Falcarius’ neck was more elongated and its forelimbs were more flexible, perhaps for reaching plants to eat. 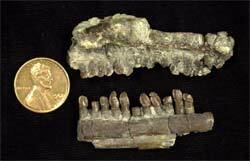 In addition to Kirkland, Zanno and Sampson, other co-authors of the study were fossil preparator Donald DeBlieux, who directed excavation for the Utah Geological Survey, and George Washington University therizinosaur expert James M. Clark. The study was funded by a $100,000 grant from the Discovery Channel to the Utah Geological Survey, which provided a matching $100,000. 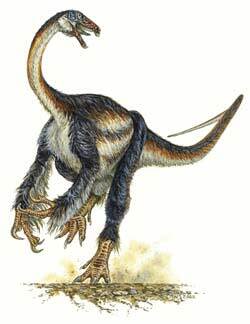 Falcarius means sickle-maker, so named because later plant-eating therizinosaurs had 3-foot-long, sickle-like claws. The species name, utahensis, comes from the fact the new species was discovered in east-central Utah, south of the town of Green River. The new species was excavated from ancient gravely mudstones at the base of the Cedar Mountain rock formation, at a site named the Crystal Geyser Quarry after a nearby manmade geyser that spews cold water and carbon dioxide gas. Kirkland estimates hundreds to thousands of individual dinosaurs – from hatchlings to adults – died at the 2-acre dig site. In the past, scientists have suggested a number of possible explanations for such mass deaths in the fossil record, Sampson says. These include drought, volcanism, fire and botulism poisoning from water tainted by carcasses. Kirkland leans toward a theory developed by Celina and Marina Suarez, twins who are geology graduate students at Temple University in Philadelphia. Their research on carbonate-rich sediments in which the dinosaurs were buried suggests the area was near or in a spring, and that there were at least two mass die-offs. That raises the possibility the dinosaurs were drawn repeatedly to the site by water or an attractive food source – perhaps plants growing around the spring – and then the spring occasionally would poison the animals with toxic gas or water, Kirkland says. Falcarius is the fourth new dinosaur species Kirkland has discovered in the Cedar Mountain Formation’s Yellow Cat member (a unit of the formation) in 11 years. Others are meat-eaters Utahraptor and Nedcolbertia, and an armored dinosaur named Gastonia. Therizinosaurs have been found for 50 years in China and Mongolia, but were not recognized as a distinct group until about 25 years ago, Sampson says. The only therizinosaur known previously from North America was Nothronychus, which Kirkland discovered in the late 1990s in New Mexico. It was 90 million years old, so scientists initially believed the older therizinosaurs in China had migrated over a land bridge from Asia through Alaska to the American Southwest. But due to the constantly shifting plates of Earth’s surface, Alaska didn’t exist 125 million years ago – the age of both Falcarius and the oldest known Chinese therizinosaur, Beipiaosaurus. So scientists now wonder if therizinosaurs originated in Asia and migrated through Europe to North America before the Atlantic Ocean basin opened up, or if they originated in North America and migrated through Europe to Asia. “Falcarius may have been home-grown,” Kirkland says. Kirkland says Falcarius likely was covered with shaggy, hair-like “proto-feathers,” which may or may not have had a shaft like those found in bird feathers. No feathers were found with the Falcarius fossils. Feathers rarely are preserved, but “a number of its close relatives found in China had feathers [preserved by unusual lake sediments], so the presumption is this animal too was feathered,” Sampson says. Therizinosaurs have been enigmatic. Until Falcarius, only “bits and pieces” of other species’ skeletons had been found, and “their anatomy was so different from that of any other dinosaur that we didn’t know what to make of them,” Zanno says. The most advanced therizinosaurs – which lived 94 million to 65 million years ago – had larger bodies, long necks, short legs, broad hips, short tails, lightly built skeletons, small heads and many small, leaf-shaped teeth – except at the front of the face where there likely was a beak and – in the case of Therizinosaurus – 3-foot-long claws. The plant-eating, elephant-sized Therizinosaurus – a name that means sickle lizard – was “the ultimate in bizarre,” resembling “a cross between an ostrich, a gorilla and Edward Scissorhands,” Zanno says. Kirkland says it is not surprising that Falcarius represents an intermediate step between carnivorous and herbivorous dinosaurs because “all lines of plant-eating animals had meat-eating ancestors.” Long before Falcarius existed, numerous plant-eating dinosaurs such as brachiosaurs already had arisen from meat-eating relatives, he adds. 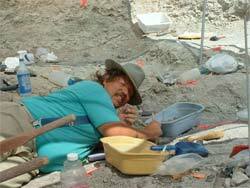 In 2001, Kirkland located the site where the new dinosaur species was discovered thanks to a commercial fossil collector who later was convicted of fossil theft. Kirkland first received fossils of the new dinosaur in 1999, when he worked in Colorado and people brought him the bones from a fossil show in Tucson, Ariz. Later, Denver fossil enthusiast John Scandizzo provided Kirkland with rough coordinates to the therizinosaur site, but Kirkland could not locate it. So Scandizzo introduced Kirkland to Lawrence Walker, who had taken fossils from the site. Walker led Kirkland to the site. Kirkland soon applied for a digging permit from the federal Bureau of Land Management, which asked Kirkland to give a legal deposition. In November 2002, Walker was indicted in U.S. District Court in Salt Lake City for theft of government property. He pleaded guilty, was sentenced to five months in prison and 36 months of supervised release, and was ordered to pay $15,000 in restitution. He served his prison time in 2003 and then returned home to Moab, Utah. Although Walker led Kirkland to the site, “we simply can’t justify illegal activity because it might let us know of something we might not know otherwise,” Sampson says. From News Release issued on May 4, 2005.